It is unclear how McCabe is said to have misled investigators. Guy wrote previously about what caused McCabe to leave prior to his pre-determined retirement in March. It was the DOJ inspector general, who found something disconcerting, which prompted FBI Director Chris Wray to order McCabe into another office. 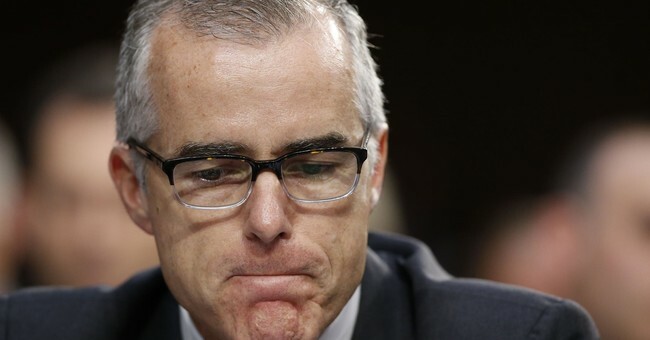 It would have been a demotion, so McCabe decided to exit early. McCabe has been a controversial figure at the bureau. He’s directly mentioned in the text messages between FBI agent Peter Strzok and bureau attorney Lisa Page. The number of messages are in the tens of thousands, but they’re pro-Hillary and explicitly anti-Trump. This is not something you can tolerate during a counterintelligence investigation into Russia-Trump collusion, which Strzok signed off on in July of 2016. It’s not something that’s tolerable when you’re investigating Hillary Clinton’s email server, which Strzok was also apart of—and there’s even a text from Page wondering if the FBI was going too hard on the former first lady. The allegation of the fix being in is palpable. When Special Counsel Robert Mueller, who now heads the FBI’s collusion probe, found out about the texts last summer, he removed Strzok and transferred him to human resources in August of 2017. Strzok was a top counterintelligence agent. The other eyebrow raising text was one sent by Strzok to Page on August 15, 2016, where the former mentions meeting with “Andy,” McCabe, and mentions an “insurance policy.” That insurance is alleged to be the Trump dossier, compiled by a British ex-spook who was contracted by Fusion GPS after their services were retained by the Hillary Clinton campaign. It was opposition research that looks like was used to secure a FISA warrant to spy on former Trump adviser Carter Page. The two also discussed ways to skirt federal records regulations, so why are they still at the FBI? That’s a tale for another time. For now, we await the DOJ’s report on McCabe and how this is part of a long and sad story about how the nation’s preeminent law enforcement and domestic intelligence agency become engulfed in politics, damaging its reputation for professionalism and impartiality on its investigations. Last December, McCabe also drew the ire of House Republicans on the Intelligence Committee after he said he didn’t know where the dossier’s funding came from, despite signed documents by him showing that he knew how this document was financed.